A few years ago now, Toyota launched their all new flagship sports coupe. This sports car was to be front engine and rear wheel drive with decades of heritage and pedigree going into the design and build. The vast majority of the heritage and pedigree, stemmed from the Toyota 2000GT and the Toyota Corolla AE86. As such, the Toyota GT86 was born and as no strangers to performance cars, I was keen to get a drive in the new Toyota. Curtis Cars in Ballymena came up trumps after launch and not only gave me a test drive for review in one, but they also gave me the Toyota Racing Developments (TRD) car to test once it arrived in the showroom also. Driving the GT86 for an hour or two here and there didn’t really do much for me, with the nature of the engine, there isn’t such a thing as instant, low down power. 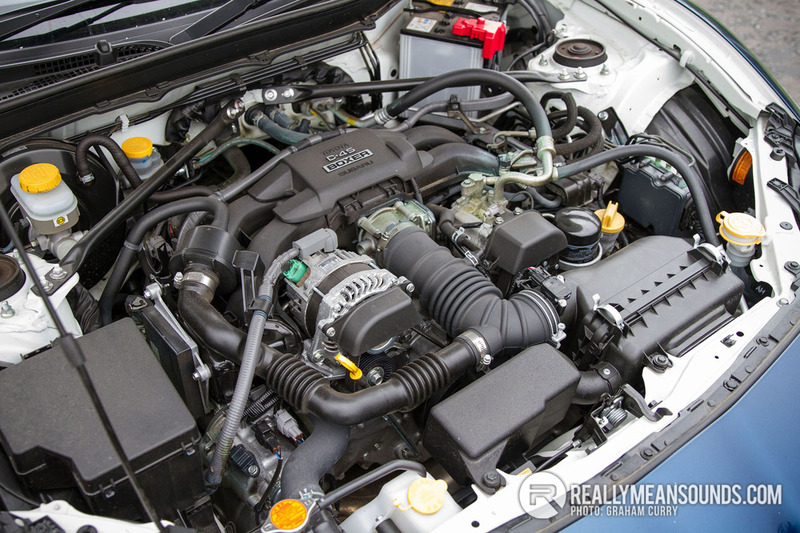 The engine needs to be revved hard to make the most of the GT86 and this is something I couldn’t bring myself to do and as such, I never fully explored the GT86 so was dismissive as to its true ability. This was until last week however when Toyota GB let me loose in their Heritage “Shelby GT86” for a week long review and after a few days, it and I became locked in somewhat of a love affair. Living with the car as a daily driver and racking up a few hundred miles over seven days, really allowed me to explore the car and oh my, it was fun. 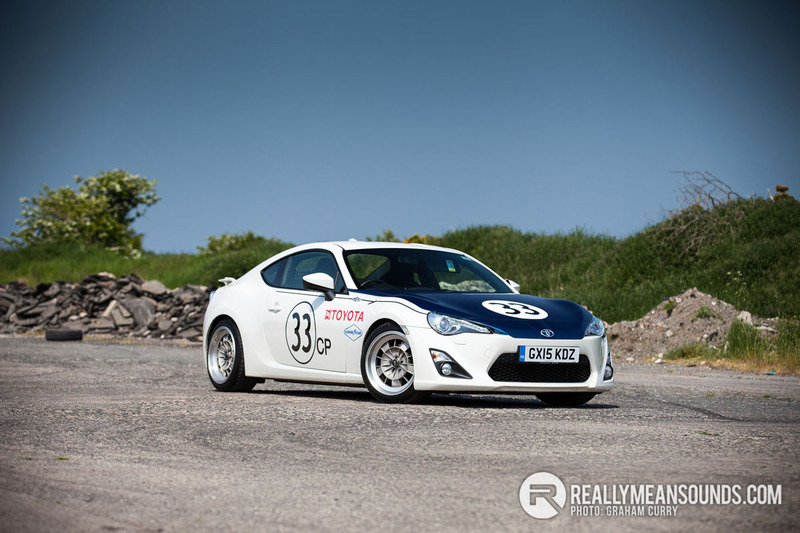 This particular car was built as part of a throwback stunt from Toyota and debuted at the Goodwood Festival of Speed last year, whereby Toyota built six GT86’s as replicas of successful and iconic race cars from years gone by with this particular car is a throwback to the Shelby 2000GT that raced in the Sports Car Club of America production class. Legend of motorsport, the late Carroll Shelby was entrusted by Toyota to build two cars for the USA racing series and during the 1968 season, with Scooter Patrick and Dave Jordan at the helm, Toyota racked up several race wins with second and third overall at the end of the season. This GT86 tested comprises the colour scheme of Jordan with the race number of Patrick on the front and sides. Back then the 2000GT cars were made lighter, much lower and with lower profile tyres and the same has been done with this GT86 for added nostalgia. From first glance the GT86 looks meaningful and this is further enhanced with the Motor Mode livery and V-Maxx 40mm lowering springs fitted to this model tested while the retro look and meaningfulness is finished off with a set of stunning 17” Rota Retro 2 alloy wheels shod in the finest 234/40/R17 Continental rubber. The GT86 has beautiful flowing arches and curves yet a very sharp front end in contrast which work great together with the rear bumper valance accommodating a pair of tailpipes from the upgraded Milltek exhaust. Looking up there is a very sleek and subtle spoiler on top of the boot lid. Opening this boot lid reveals average load space that is expected with most coupe’s and an entry gap that is a little limiting. It would easily take a race suit and helmet, a small buggy, handful of back packs or a couple of weekend bags. Inside the cabin I was greeted with a popular mix of black and red, the very supportive seats are in a material I have never seen much of and have no clue as to what it is, however it was nice, especially with the red upper winglets and red stitching giving it that sports feel. The rear seats are more or less irrelevant as nothing more than a Jack Russell will fit on them with any degree of comfort so I will move swiftly back to the front. Gear knob, gear gaitor and steering wheel are all finished in black leather with red stitching which the steering wheel having a little retro look to it. Alloy pedals finish off the sports feel inside the cabin and passenger comfort is aided via the dual climate control with the driver having little effort with keyless entry and a push button start. Dash materials are as expected for a Japanese brand and the carbon effect parts of the dash are a little try hard. Infotainment is kept simple with an optional “touch & go” system in this model at a sensible £750 which incorporates a small screen for the sat nav built into the dash which angles awkwardly towards the passenger. 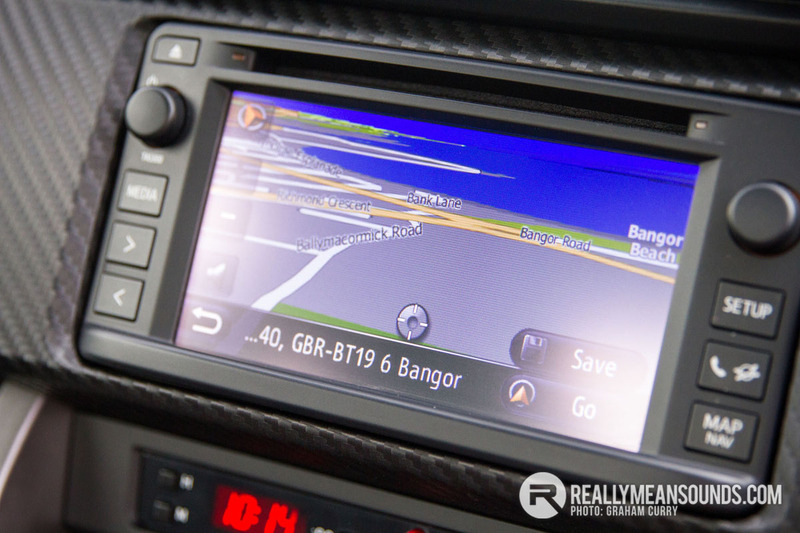 Along with the sat nav there is Bluetooth, usb & aux input and it will even display sms on screen which was a nice addition. In all honesty, compared to the systems other manufacturers are using it may look and feel very dated, however I personally found it ideal for use as it doesn’t over complicate anything nor does it try and do too much, Toyota have kept it simple and well done for that. Under the bonnet now and the GT86 is equipped with a Subaru/Toyota collaboration with its 2.0L boxer engine (pretty much only ever seen in Subaru’s until now) which to me is the perfect type of engine for this car due to its mesmerizingly low centre of gravity which in turn aids the driving and handling experience. However a good chassis with perfect balance is nothing without a little punch and this engine produces a reasonable 197bhp with 150lb/ft of torque which as stated before isn’t the most lively low down on the rev range however once wound up above 5,000rpm it really comes to life, in a way that a Honda V-Tec engine would come alive in fact. This to most petrol heads would be quite un characteristic of such an engine however it seems to work well as around town and on the daily commute the GT86 will return close to 40mpg and when wound up will still achieve an honest 30+mpg. Over the few hundred miles I done of mixed roads and abuse, I averaged 33mpg which was astonishing. 0-60mph comes in just 7.7 seconds with a top speed of 140mph and this entire grunt is put to the rear wheels via a limited slip differential, an LSD that on tight parking and manoeuvring could be heard “doing it thing” which to me is the sign of a rear car. There are no sloppy open differentials here, its number elevens along the drag strip for the GT86. Onto the drive I can confirm that this chassis is simply something else, it handles incredibly well on major roads and in standard guise would be superb on all of our roads, however the lowered suspension on this model was a little too firm and upset the car uncomfortably on our undulating Irish roads, on track though I can image this set up would be perfection. The drive is not only very rewarding but incredibly memorable too, which is something that few cars will return after a decent run before dusk. The vehicle stability control (VSC) programme is very sensitive and any sort of lightness around the rear end is soon cut short in the name of safety. 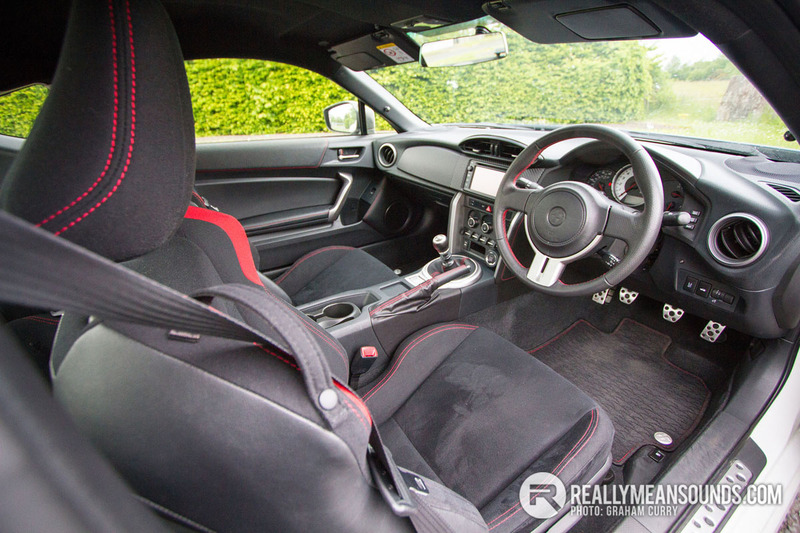 There is however a VSC Sport button in the cockpit which allows a little more slip and driver input before coming to your aid and the GT86 was most certainly best enjoyed in this mode, it made a big difference. Then for the Keiichi Tsuchiya’s out there, you can switch off all driver aids and hit the drift track with a smile and the GT will perform with ease. Overall I really got to know this charming little car and got to understand the heritage and pedigree that has went into its engineering and indeed have fallen in love with it, as has my wife who was incredibly sad to see it leave the drive two days ago. If you have never experienced one of these cars then you really are missing out and at a mere £25,000 OTR they are incredibly affordable fun with quite a bit of practicality to boot if you don’t need more than two seats. I would like to thank Toyota GB for entrusting me with one of their one off heritage cars and if there is ever a chance in the future to get another drive, I will be there in a heartbeat! I hear they are some motor with a supercharger. @chris_b :p Your reports and reviews are excellent Graham.